As I head into the last leg of my 10 week trip, more people have been asking me what my favorite place (country and/or city) has been so far and I really haven’t been able to answer the question. But, after only 2 days in Colombia, I knew this country, and maybe even this city was my favorite thus far. Bogota is a great introduction to Colombia. Fantastic culture, food, and history – all in one city! Upon our arrival, we were warmly greeted at the airport by vendors and taxi attendants. I didn’t mind, even if they were just looking for our business. Our arrival was not as overwhelming as it has been in a lot of big cities we’ve been where they just aggressively ask you to follow them. We caught a taxi from the airport and the warm welcome continued – Marc had a long, lovely conversation with the driver who gave us a bunch of tips and advice on Bogota must sees. We met up with our friend, Janice who had arrived earlier from San Francisco and was waiting for us at our hotel in Chapinero. Apparently, this neighborhood is known for its great eats. I was exhausted and had a huge headache when we arrived (probably from the altitude (2500m) and from being dehydrated after the 6 hour flight from Buenos Aires), but I forged on and we all went out for dinner. We randomly stumbled upon Mordida Bistro, a very chic and modern restaurant. There was a little bar area at the entrance and they served fancy cocktails (right up Janice’s alley!). The table mats even read LOCAL, ORGANIC and 100% NATURAL – of course now that we, two Brooklyn residents, were joined by a San Francisco hipster we would end up at such a restaurant! 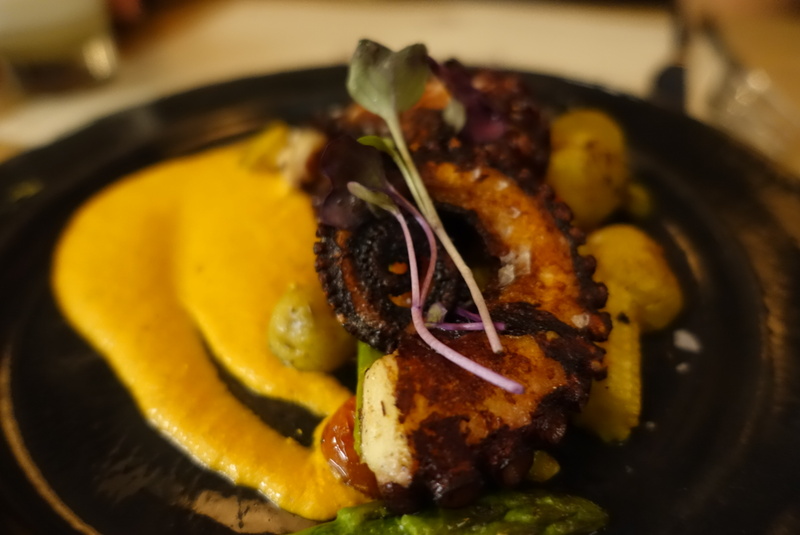 We started with this amazing grilled octopus dish which was so tender on the inside and a little crispy on the outside. I ordered the ceviche 3 ways and swear it was much better than what I had at La Mar in Lima, which is world renown for its seafood! Marc and Janice requested an atípico Colombian drink and the bartender suggested an Aguardiente sour. Aguardiente is apparently a very popular liquer in Colombia. It’s a clear alcohol flavored with anise and tastes a lot like licorice. The Aguardiente sour they made was delicious!! It was so good, we ended up coming back the next day for more drinks. Plaza del Chorro – it is believed this plaza is where Bogota was founded in August 6, 1538 and where the first street of Bogota is located. Plaza Bolívar – this is the heart of Bogota’s historical district. Of course there is a statue of Simon Bolivar in the center (every city we’ve been to has a statue of the guy. He did help all of them gain independence from Spain after all.) This plaza is huge and it has way too many pigeons (the rats of the sky, ugh gross). They have women selling food to feed to the pigeons. (Really, WHY?!) In the plaza, you can find the Cathedral of Bogota, National Capitol (for Congress), the Liévano building (for the Mayor), and the Palace of Justice. The last building is relatively new looking compared to the other ones. Why? Because the original building was destroyed in 1985 during the Palace of Justice Siege. On November 6, 1985, the guerilla group M-19 stormed the Palace of Justice and took 300 hostages in with the goal of forcing the justices to try the president and the defense minister at the time for violating a peace of agreement. In an effort to retake the building, the government used explosives and weapons. In the end, at least 100 people ended up dead from the assault. According to Mark Bowden’s “Killing Pablo” and Escobar’s son, Pablo Escobar supported M-19’s siege and gave the leader money to destroy the criminal documents (as shown in Netflix’s Narcos – that scene was the first thing I thought of when the tour guide explained this to us). The National Park– we took a break at the beautiful National Park and had a snack at the food stall. This is where we tried borojó juice, an aphrodisiac, which apparently improves sexual performance. Or really just known to give you energy. We also had a fruit cup which they cover in cheese and some sort of cream – tastes much better than it sounds! Guanábana – we had the juice version of this. It has a custurdy texture and it reminds my of lychee with big seeds. Granadilla – this is my favorite! It’s another passion fruit – it’s really juicy and filled with seeds that you can basically slurp. Apparently, schoolkids would hit the fruit against their heads to crack it open. Tejo game- Colombia’s national game. The next coolest part of the tour. It’s an explosive game that involves gunpowder and beer. Basically, you start with a slanted wall panel/post covered in mud. You place a couple of triangular pieces filled with gunpowder in it and use rocks to try and hit these pieces. When you hit it, it makes an explosive POW! It’s so ridiculous but kind of fun. We played for 30 minutes or so and drank some beer of course. Apparently, it’s uncommon for women to play this game. So uncommon, they have urinals in the middle of the warehouse and no toilets. We were playing in a smaller space upstairs and there was a urinal just hanging out in the corner and the men up there seemed to be a little uncomfortable going with us women around. I can see how this is catered to men. In our group of maybe 14 people, we played round after round with no one hitting anything. Then, one of the girls finally hit one! We were all ecstatic. We continued to play and no one was hitting the marks. The men slowly began to get more and more frustrated. They were determined to hit one before we left, so we stayed for a while…no one else ever hit it. Can you find the urinal? Cafe de la Fonda coffee factory – Of course we had to stop by a coffee factory on our tour. It wouldn’t be a proper introduction to Colombia without some Colombian coffee! Fresh and delicious here. They even have an option for carajillo which was coffee with aguardiente! I thought it tasted weird. Calle del Sol Building- Colombian intelligence service used to be here and they say they practiced torture here..
After our bike tour, we headed to the Gold Museum. 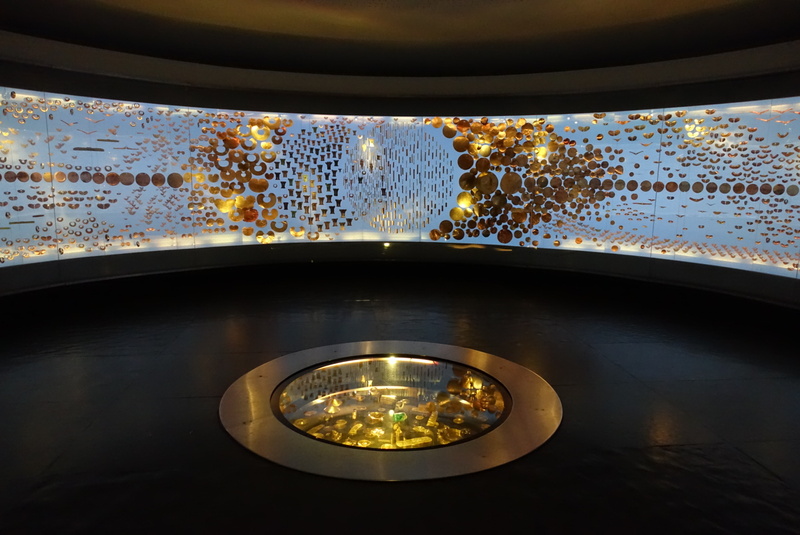 This museum houses pre-Hispanic gold-work from various parts of the country. There are some very impressive pieces in the museum. It’s hard to believe they made these intricate little things with the tools they had back then. The son el lumiere is the most impressive exhibit in the museum. 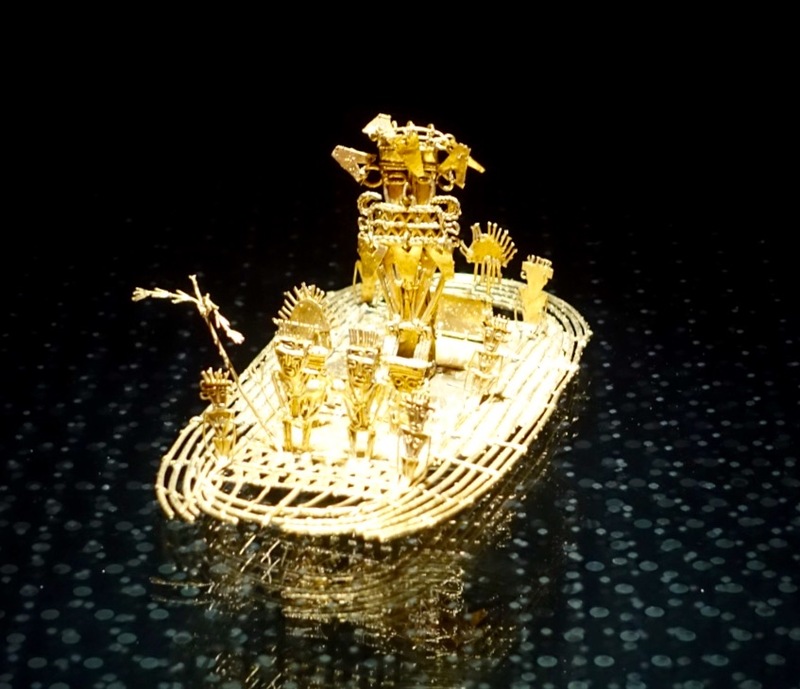 The re-enactment represents the El Dorado myth and ceremony performed on a river. Imagine the raft below on the Guatavita Lake, where they believe the Muisca people performed these offerings and then watch the video. Next, we tried to catch the sunset at Cerro Monserrate. We arrived right at sunset, stood in line for 1 hour 30 minutes to buy tickets and then realized there was ANOTHER 1 hour wait for the actual ride on the funicular or teleferico to the top. By then, it was dark and we were tired. We literally reached the ticket booth and before buying a ticket, we left and decided to go back in the morning. Apparently, December is a busy month because locals flock here to see the Christmas light display at the top. Christmas in Colombia is a BIG deal. In the morning, we only waited 10 minutes for tickets and 20 minute for the funicular. However, it was Sunday and there was a church service on top of the hill. It was packed and crowded. The views were beautiful but the crows really killed the vibe. For lunch, we had randomly stumbled into a cafe called Chantonner and had the BEST sandwiches ever. And then in the evening, our hotel misdirected us to a restaurant that closed and we unintentionally ended up at this Atipico Colombian restaurant. The owners were super helpful and friendly there. They explained every dish to us. They even treated us to shots and free appetizers! Between the three of us, we had three typical Colombian stews – ajiaco, sancocho, and mondongo. They were ALL delicious and I don’t even really like stews. Greatest dining experience ever. I love that you can go anywhere in Colombia and find good food and great people! Next stop, 10-hour overnight bus to San Agustin!